Over the last many years, the late Shri. 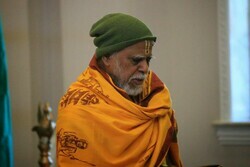 Yagneswara Dikshitar was a central presence in Chicagoland's(and country-wide) Vedic events, as a part of and also independent of Gayathri Yagna. Shri.Dikshitar's wife and his daughter Mrs. Saradha are invited to attend this function. 5.15 - 6.00 Bhajans by Smt.Srividya Ganesh on behalf of Sri Radhakrishna Sangeerthana Samajam. 6.00-7.00: Tribute to Shri.Dikshitar - a Celebration of his service - (including some snippets of of Shri.Dikshitar's participation in Yagnas, Sita Kalyanam, Veda classes, KKSF and other individual events). 7.15 PM: Future Programs and review of Gayathri Yagna, Conclusion. Dinner to follow. © gayathriyagna.org. All rights reserved.